In 10-inch skillet (preferably nonstick), heat oil over medium-high heat until shimmering and hot. Add salmon and cook 3 minutes or until brown on one side. Flip and brown other side, about 3 minutes longer. In small bowl, mix all sauce ingredients. Add mixture to skillet. Reduce heat to medium-low. Cover and cook 8 to 12 minutes or until salmon flakes easily with fork. Place salmon on serving plates and drizzle with sauce. Why it Works: Flaky Fish Would you ever confuse a salmon steak for a porterhouse or pork chop? 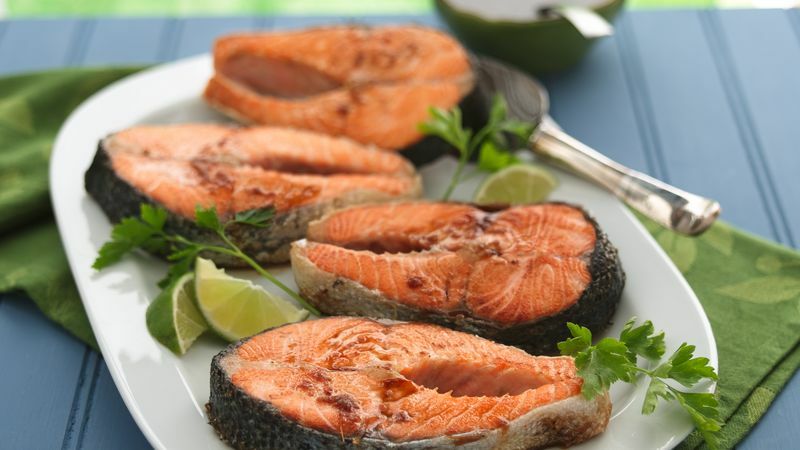 While vastly different in color and flavor, the texture alone sets fish apart from other meats. This difference has much to do with where the animals live and how they use their muscles. Land animals, like chickens and pigs, spend most of their time moving fairly slowly. Their muscles are grouped in long, thin bundles; when cooked, you need a knife to cut through the muscle. Fish, on the other hand, need quick movement in the water in order to swim. Their muscles are short and round; when cooked, their muscles separate and become flaky.